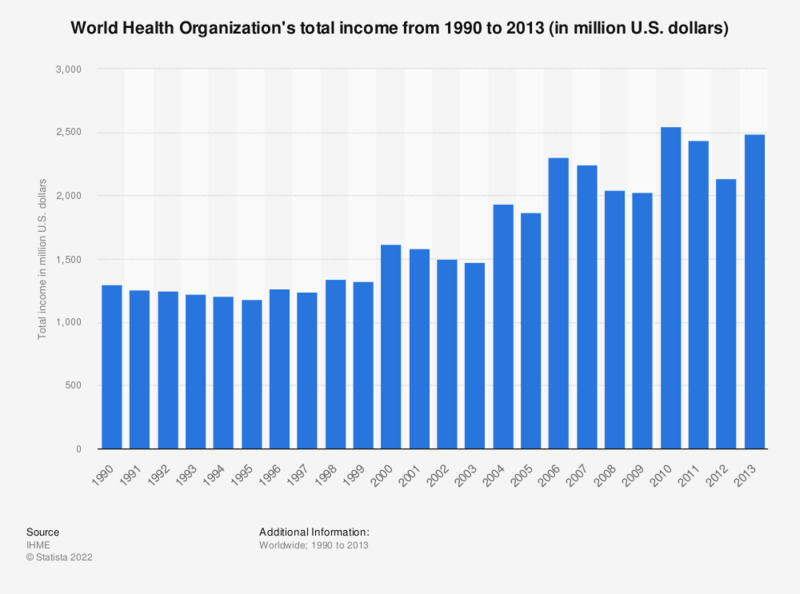 This statistic shows the total income of the World Health Organization (WHO) from 1990 to 2013. In 2005, WHO had a total income of 1.87 billion U.S. dollars. WHO is the directing and coordinating authority for health within the United Nations. It provides information and leadership on global health matters, shapes health research agenda, sets standards, describes evidence-based policy options, provides technical support to countries, and monitors and assesses health trends around the world. The WHO has increased their total income in recent decades, from 1.3 billion U.S. dollars in 1990 to 2.5 billion U.S. dollars in 2013. The organization's development assistance for health also grew during this time from 1.3 billion U.S. dollars in 1990 to 2.76 billion U.S. dollars in 2013. In 1945, Dr. Szeming Sze, a delegate from China proposed the creation of a global health organization. At first the resolution failed to pass but on July 22, 1946, the constitution of the World Health Organization was signed by all 51 countries within the United Nations. Andrija Stampar was elected the first president of the WHO. Its main goals at this time were to mitigate the spread of malaria, tuberculosis, and sexually transmitted diseases as well as improving global maternal and child health. Today there are several regional headquarters around the world including Copenhagen, Denmark; Cairo, Egypt; and Washington D.C., United States. Recently, critics claimed that the WHO had over-exaggerated the danger of the 2009 swine flu pandemic, which caused citizens to panic due to a lack of information. At its peak, the swine flu (influenza A H1N1) caused over 1,000 deaths in one week worldwide. Statistics on "Nonprofit organizations and NGOs in Italy"
Do you think that the NGOs involved in migrant rescues are operating transparently? According to you, is the political controversy over NGOs and migrants legitimate or instrumental? The Italian government is considering to close its ports to foreign NGOs rescuing migrants. Do you agree with it?